Facebook has more than 1.3 billion daily active users, with each one of them spending an average of 50 minutes within their apps. Given the sheer presence and popularity of The Social Network, it's a platform that marketers simply cannot ignore - however, research has revealed that only around 45% of marketers think that Facebook marketing is effective. This implies that most marketers are still finding it difficult to generate leads for their businesses. According to the State of Inbound 2017 report, 63% of marketers say their top challenge is generating traffic and leads. However, generating leads from Facebook may be easier than you think. In this post, we'll look at how marketers can generate targeted leads from Facebook. Facebook's Instant Articles is an option that enables publishers to share their content to Facebook via dedicated methods within the app. Facebook created Instant Articles to combat the problem of slow loading times on the mobile web - Instant Articles load up to 10x faster than mobile web articles, and are denoted by a lightning symbol within the image on the Facebook post. According to Facebook, Instant Articles generate 20% more clicks than mobile web articles from the News Feed, and when a user clicks on an Instant Article, they're 70% less likely to abandon the article before reading. The stats underline why IA is an opportunity you can't afford to ignore. 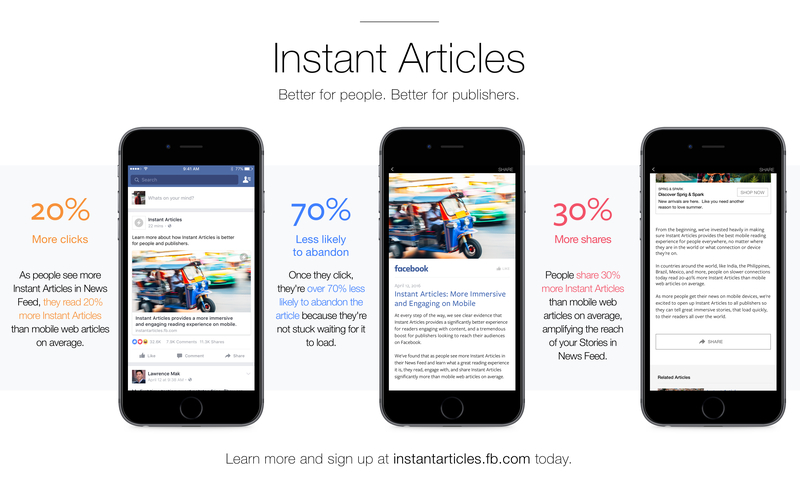 The good thing here is that you don't need a call to action within Instant Articles in order to drive traffic to your website - you can use Instant Article to capture audience data without having to direct people to your landing page. In order to do this, you need to create an opt-in form within your Instant Article - there's more insight on how to do that here. Another great thing about using Instant Articles to generate leads is that your readers don't have to fill in their data, as required by traditional lead generation pages. Since they already have an account on Facebook, the system pulls in their data from their profiles and autofills the required details, streamlining the connection process. When readers confirm their details and submit it, the data is stored on Facebook. You can download it as a CSV file and upload it into your email marketing software. This option won't be for everyone, but for those that are able to make use of Instant Articles, this can be a simple way to generate more leads from your Facebook efforts. Facebook announced the debut of Messenger destination ads late last year - this type of ad is designed to drive people to chat with Messenger bots. As you can see from the above, when a user clicks on the ad in the News Feed, a Messenger thread appears with a copy of the ad and/or prefilled message prompts to start the interaction. Users can then continue the conversation or follow instructions as the case may be. This can be a great way to capture leads because customers are looking for someone to talk to before making the decision to buy a particular product or subscribe to a service. With this ad type, you can easily retarget your website visitors that have viewed your product or services before. This enables you to address any questions they might have in regards to your product or service. The option can be particularly beneficial for businesses who sell complex products or services, such as real estate agents and car dealers, as it gives them a further opportunity to demonstrate their product and expertise to their audience through prompts for immediate interaction. Video is one the most popular form of content on Facebook, and Facebook's video ad options provide a range of opportunities to connect with your audience. With the Facebook video ads, you can also easily collect your user’s data, right from inside the video ads. Your users don't have to leave Facebook, or even fill in their details. As with Instant Article forms, Facebook is able to pulls their data from their profiles to make it easy for them to sign-up. All your users need to do is to tap on your CTA to submit their information. And you know the coolest thing? The emails are Facebook verified, which makes them authentic leads. Below is an example of Facebook video ads from Splasheo. The good thing here is that you can add retargeting to your video ads. For example, Splasheo could target a large audience based on demographics and interests - with that, they can get a good number of views. But that's not all - with retargeting, they can create another audience, targeting only people who viewed 90% of the video ads. By using this method, they're able to hone in on a more specifically interested segment, which will likely boost their overall results. Facebook's lead ads option provides an easy way for businesses to collect information from users - thus, helping you to increase your leads in a simplified manner. Check out a sample Facebook lead ad from Leadsbridge below. Once a user clicks on your ads, they're shown a pre-filled opt-in form. This makes it easy for users to quickly subscribe to your lists with just two clicks, and without having to fill in extra details. What's more, Facebook lead ads, when combined with retargeting to mobile devices, can help to significantly boost your lead conversion efforts. When a user fills in the details, Facebook helps you to store the lead information in a downloadable CSV file. You can then download it to your CRM or autoresponder to utilize the data. You can also synchronize your leads library into your CRM software, or your mail provider, using the various software options available on the market. This can help you to manage your leads, while also making it easy for you to communicate with them quickly before the leads become cold. As noted in the introduction, with over 1.3 billion daily users, Facebook is one of the top platforms you can use to consistently generate high quality and targeted leads for your business. By taking a slightly different approach, such as those outlined in this post, you can capitalize on the platform to connect with your potential customers without spending much money.